When you are expecting there are so many changes happening to your body. We all know how important a good healthy lifestyle is to both you and the baby. Prenatal vitamins are a daily part of life for expectant moms. But for some of us, those giant horse pills were a nightmare. Personally, I have a condition where swallowing is difficult if not extremely painful. Taking my daily vitamin required numerous glasses of water (which meant tons of time in the bathroom). Don't get me wrong, I would have done anything to help my developing child. I just wish that there was a better way. Now there is. It is called premama. 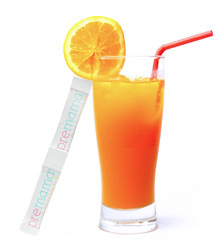 Premama is a prenatal vitamin drink complete with key nutrients including DHA, Folic Acid, and Iron. Packed with Ginger, Vitamin B6 and Magnesium to help moms with nausea and digestive relief. Moms will have two premama drinks during the day. The vitamin mix can be added to your favorite beverage. Or, if you prefer, you can sprinkle the mixture on top of your morning cereal. The mix is completely flavorless. I wish that this vitamin drink would have been available when I was pregnant. Not having to endure those large pills that made me nauseous every day would have been a blessing. Right now you can save 15% off your purchase at www.drinkpremama.com with the promotion code Sweepstakes2013. Kick those horse pills to the curb - drink your vitamins with Premama! Right now I have a 30 day supply of Premama to giveaway. Please use the Rafflecopter to enter. Disclosure: The company is providing this giveaway. All opinions are my own. Those pills are HUGE. I hated prenatals. I loved the chewable ones. Ugh! I hated taking my prenatal vitamins! This is a great solution. I would rather drink my vitamins any day!